The Pyrenees of Lleida, a whole world to discover! The Pyrenees of Lleida are well known for their offer on ski resorts and adventure activities, but there are not only these two activities to do! In the Pyrenees we can discover the nature in its purest state. Therefore, there are some natural parks: the Cadí-Moixeró natural park, a Catalan protected area with the largest number of habitats and species of flora and fauna of European interest. The Alt Pirineu natural park, the largest one in Catalonia. 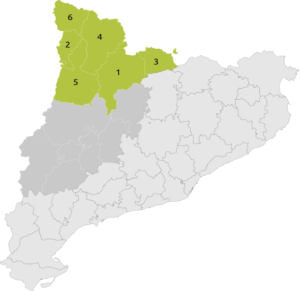 And one national park, the Parc National d'Aigüestortes i Estany de Sant Maurici, the only national park in all of Catalonia. Their landscapes and villages full of history and tradition invite us discover a tasty cuisine made with the best traditional and artisanal products. Concerning the cultural heritage, we have to highlight the Romanesque complex of the Vall de Boí and the festivity of the Falles del Pirineu, both declared Patrimony of Humanity. Welcome to the Pyrenees of Lleida!